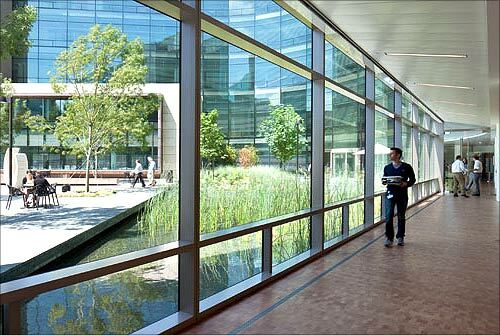 The Bill & Melinda Gates Foundation campus in Seattle, Washington has secured LEED-NC Platinum certification from the US Green Building Council. 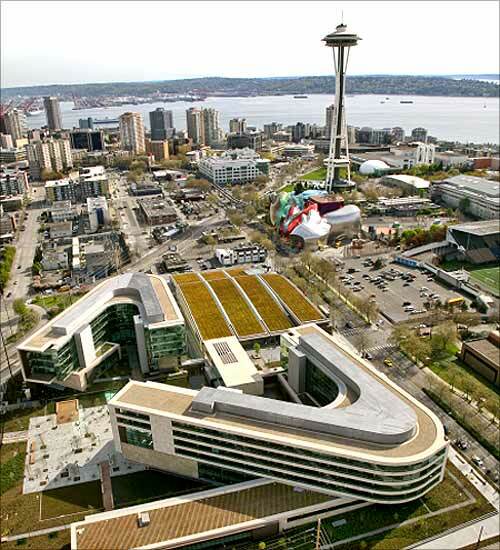 Image: Bill & Melinda Gates Foundation campus. Photographs: Courtesy, Bill & Melinda Gates Foundation. 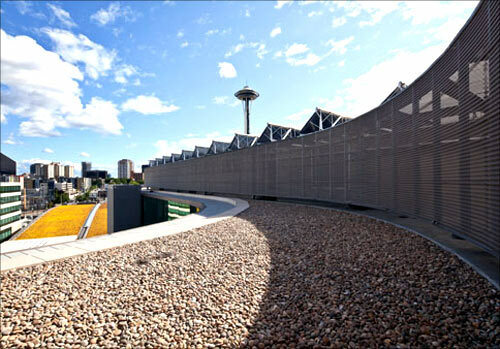 Designed by NBBJ, it is one of the world's most eco-friendly buildings with a solar energy system on the roof. The total design and construction cost for the new campus is $500 million. Bill and Melinda made a personal contribution of $350 million in 2009 to off-set the construction cost of the new campus. 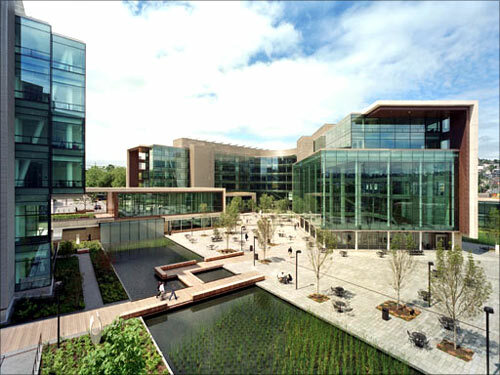 Image: Bill and Melinda Gates Foundation campus. Photographs: Courtesy, Bill and Melinda Gates Foundation. 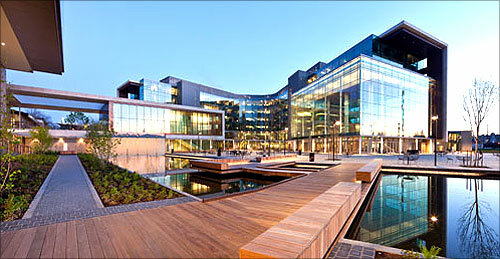 The campus includes 900,000 square feet in two six-storey office buildings. It sits on 12 acres. 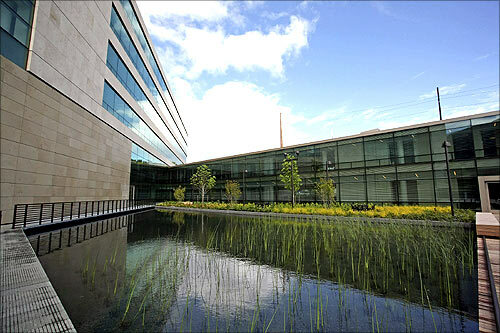 Image: A view shows a reflecting pond along the north office building in the newly opened $500 million Bill and Melinda Gates Foundation campus in Seattle. The campus was built as a long-term investment to ensure it remains a viable, efficient workplace for today and in decades to come. 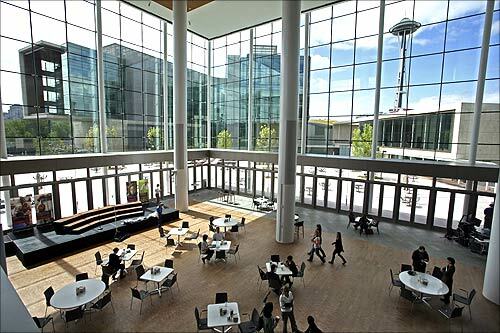 Image: A view shows the atrium in the newly opened Bill and Melinda Gates Foundation campus in Seattle, Washington. The eco friendly building is designed to last 100 years. Image: New-media employees Jennifer Hauseman and Tyler LePar have a conference on what staff like to call the diving platform on the sixth floor. The campus has a water storage system underneath its surface with a capacity to hold 750,000 gallons. 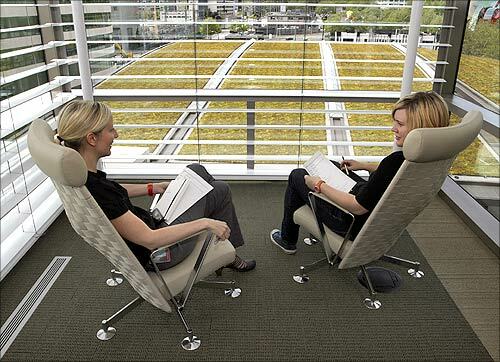 Image: Bill & Melinda Gates Foundation. Up to 1.2 million gallons of rainwater will be recycled annually. The energy-efficient systems have reduced the total energy usage of the facility by 40 per cent. There is an under-floor air distribution system for ventilation, which conserves energy and facilitates future space modifications. A one million-gallon rainwater storage system used for irrigation, water features, and toilets. Image: Courtesy, Bill and Melinda Gates Foundation. 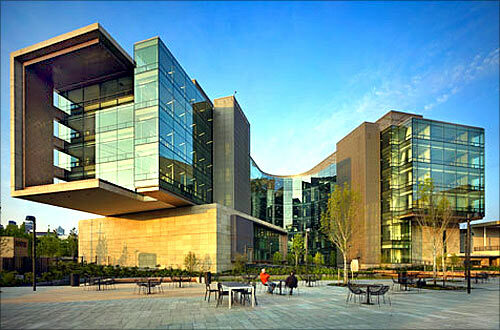 Photographs: Bill & Melinda Gates Foundation campus. Several 'living' roofs with plants, reduce run off and moderate wide temperature swings, filter air and provide a habitat for birds and insects. 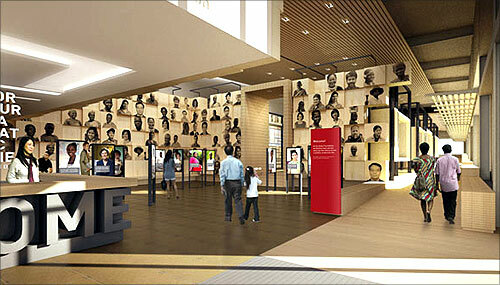 The design itself reflects the foundation's work in health and learning. The buildings are connected in a campus-like setting designed to facilitate interaction, collaboration, and learning. 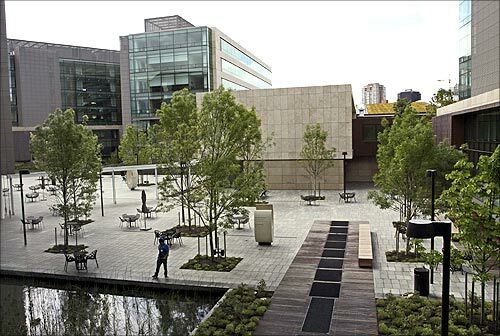 Image: Below this courtyard in the Bill and Melinda Gates Foundation's new campus is a 1 million gallon rainwater storage tank used for irrigation, toilets. 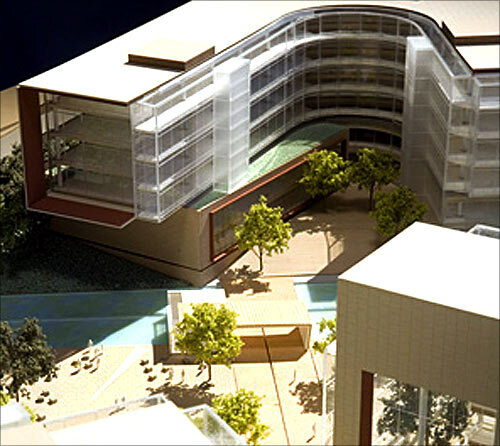 The campus design will include open green spaces and the design ensures natural light in the building. 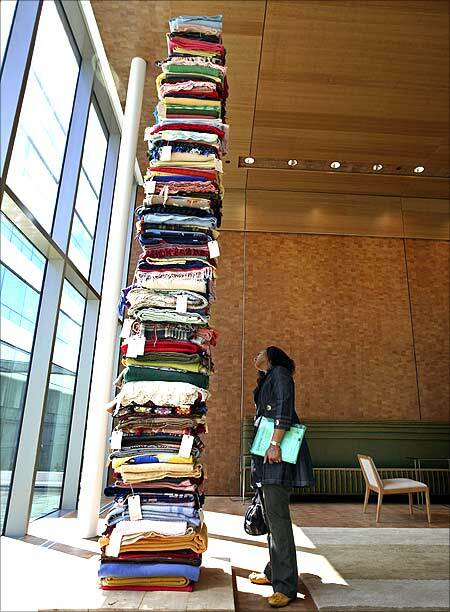 Image: Valerie Watt looks at art installation "story blankets" by artist Marie Watt in the reception area.